In 2001 scientists, Gabriela Martinez and Philipp Steinmann wrote a seminal paper on the lack of devices available for accurately controlling and screening the temperature for protein crystallization. As a protein crystallization scientist, Gabriela recognized that there wasn’t any technology available to scientists in this field to accurately and quickly identify key temperatures at which to perform protein crystallization experiments. They spent the following eight years, developing and refining technology to fill this gap and solve this problem. 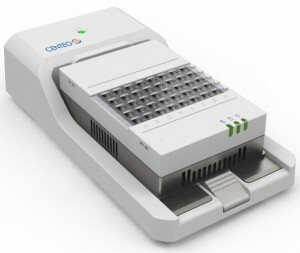 In 2009 they setup Centeo Biosciences to provide temperature-screening tools for protein crystallization. After operating alone for some time, Centeo Biosciences saw that becoming part of the Blacktrace group would not only secure the new company’s future but also allowed them to leverage Blacktrace’s expertise in Productizing Science®. Centeo recognized that the Blacktrace group were well equipped to engage the scientific community, understand their problems and needs, and then identify and /or develop technology to meet their needs. In early 2013 Centeo Biosciences joined the Blacktrace group. Whilst still focused on providing screening tools for protein crystallization, they moved from statically screening temperature in an isothermic way into controlling temperature in a more dynamic way. This means providing products for specific applications such as embryo research and protein crystallization.